Long Reach hospital was built in 1901, with 300 beds to deal with the smallpox epidemic at the time. The ships were full so a temporary hospital was built alongside. The MAB gave directions to Architect A&C Harston to built the temporary hospital. The hospital was to be worked as an auxilery hospital to the ships with Dr Ricketts as Medcial Supeintendent (MS) working with Matron Wacher and Steward Moule. The first patients arrived on 27th February 1902. In 1910, it was decided that Long Reach would be kept permanently in reserve for smallpox and the other River Hospitals (Orchard and Joyce Green) would be used for fevers and convalescence. The need to carry out repairs was now paramount as it had originally been build with a two year life expectancy. The delays in repairs were due to Dr Rickets absence, he had been on sick leave for a year. When he returned in the autumn 1912, he demanded changes to the plans made in his absence. His changes must have been elaborate as nothing was done before 1914 and the outbreak of WW1 put paid to them for the duration. 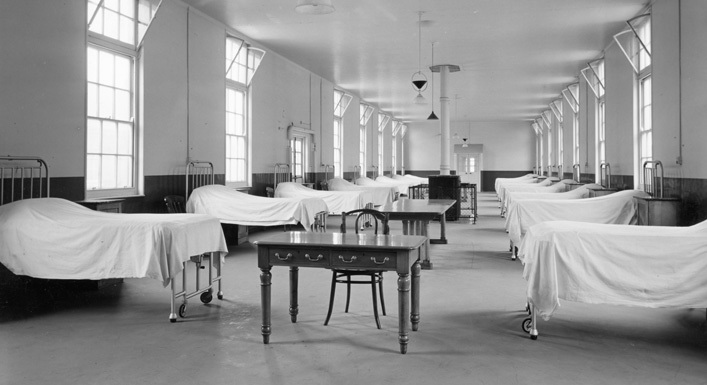 In 1928 the hospital was rebuilt as a permanent smallpox hospital, at the same time there was an outbreak of variola minor, the milder version of smallpox. On the 1st February 1953 the Thames flooded, by 2am Long Reach was submerged to a depth of 6 feet. The water swept in the North Gate at Joyce Green, a distance of half a mile from the river. The Gate Porter was the only member of staff on duty at Long Reach and he waded to Joyce Green. During the afternoon of 2nd February the water flooded the adjacent firework factory (Joseph Wells) and a chemical reaction caused a fire and three explosions which shattered 500 panes of glass at Joyce Green. The last of the water was pumped out of Long Reach from the 18th-22nd February and the clean up began. The boilers were restarted on the 2nd March. By the 1960’s Long Reach had 50 beds on standby and could be reopened in two hours should a case be diagnosed. The staff were on permanent standby and received a small salary in return. They moved in for 14 days at a time and all their clothing was destroyed when they left. The staff to patient ratio was 14:1. In 1961 it cost £340 per week, £18,000 per year to maintain Long Reach. By 1973 just 30 beds were kept on standby. In March 1973 Long Reach was opened for one patient. The call came at 9am and the staff were re-vaccinated (this happened every time they were needed) and were ready to receive the patient by 10.30am and smallpox was confirmed. This was the last patient ever to be treated at Long Reach. Long reach was knocked down in 1974 to make way for improved flood defences. The last outbreak of smallpox in England was in 1975, from a laboratory iin Birmingham and the last case in the world in Somalia in 1977.